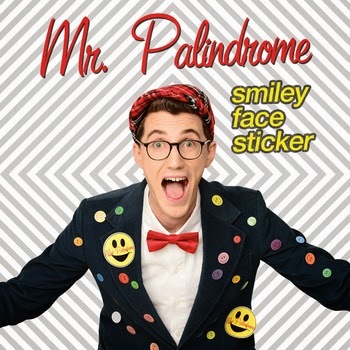 Mr.Palindrome has been a hit for my young listeners! He is funny! I absolutely love it when he sings the ABC backwards. I have yet to figure it out exactly but hoping the kids will hear it enough and know it. What a great thing to know as a kid! Mr. Palindrome, an Australia-based musician-dad and alumnus of the Berklee College of Music in Boston, will celebrate the U.S. retail release his first CD, Smiley Face Sticker, on 9-1-9 (Big Kids Productions, September 19, 2013), in anticipation of a winter family concert tour in the United States. My son likes to watch and watch and rewatch this you tube video! In fact, Mr. Palindrome wants to help kids get comfortable with words, even really, really big words. Along with some starting-point palindromes, Mr. Palindrome introduces concepts like “alliteration,” “anagrams” and “onomatopoeia.” Sing along and learn how to sing the “Backwards Alphabet,” and a whole gaggle of “Tongue Twisters.” MrPalindrome.com offers parents and teachers activity ideas to enhance learning. On his YouTube vlog, Mr. Palindrome also demonstrates crafts like how to make a pencil case or build a cup tower, all simple and silly ways to have fun and learn new things. Growing up, Natan learned to love palindromes and puns early on. “I always loved to play word games as a kid,” he says. “But it wasn’t until I took a course called Nonsense Literature at Berklee that I realized that I could build a whole career out of it.” His family is happily palindromic: he and wife Lil have a daughter Ayala who was born on 21 February, 2012 (21/2/12 in Australian date style). Over the last couple of years, Mr Palindrome has honed his craft before thousands of schoolchildren in his home country. He is currently booking concerts on the West Coast, including several San Francisco Bay Area performances, in December and January. Smiley Face Sticker will be available from various retailers. Suggested retail price is $15. For more information, visit http://www.mrpalindrome.com/.